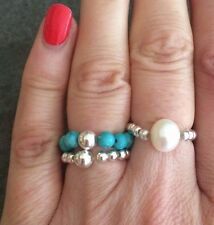 ☆This beautiful 3 opal sterling silver stacking ring is handmade by myself. These stunning opals are lab created. ◇ It is perfect for daily wear or special occasions, birthdays, weddings, anniversaries, Christmas. ☆This beautiful ring is delicate and stunning. All rings are made to order, and will have slight variations to the picture. ◇This ring is size Q (other sizes are available on request) ☆I can make bespoke items to order, and i have other stones and metals available. Message me if you have any questions. ◇I will post out the ring first class in a padded envelope. 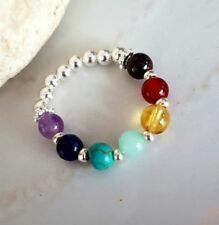 Tiny 7 Chakra gemstone bead stretch ring. 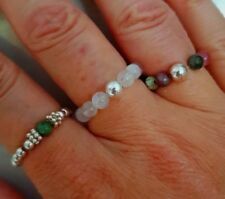 Simple beautiful handmade skinny stretch bead ring with 7 4mm genuine gemstone beads in order of the 7 Chakra's. Root Chakra : Garnet. Sacral Chakra: Carnelian. Chakras - Heart Chakra, Throat Chakra. These rings are perfect for stacking up, with my other stretch bead rings. Malachite absorbs negative energies and pollutants, picking them up from the atmosphere and from the body. January Birthstone Jewellery : Garnet or Rose Quartz. 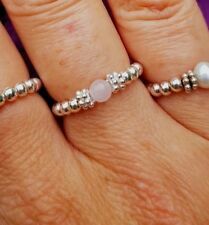 Gorgeous handmade Rose Quartz Sterling Silver stretch ring. Rose Quartz has a gentle vibration of love for the owner. Rose Quartz opens the heart to love. Gorgeous Blue Turquoise Sterling Silver gemstone stretch bead stacking ring. Turquoise is the birthstone for December. I have matching necklaces. Turquoise carries great wisdom of basic truth within it. 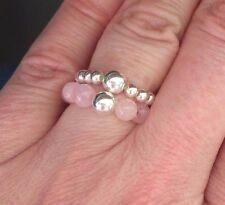 Gorgeous handmade Rose Quartz Sterling Silver stretch ring. January Birthstone Jewellery : Garnet or Rose Quartz. Rose Quartz has a gentle vibration of love for the owner. Rose Quartz opens the heart to love. Moonstone is composed of Orthoclase and Albite, two species from the Feldspar group. Moonstone is a 3rd Anniversary gemstone. Chakras - Third Eye Chakra, Solar Plexus Chakra. These rings are perfect for stacking up, with my other stretch bead rings. It does this by making a clear connection between the earth plane and other planes and worlds. It also is said to bring emotional stability and inner strength. To be flexible at need is a sure sign of strength. Jade Chakra Healing and Balancing Energy. 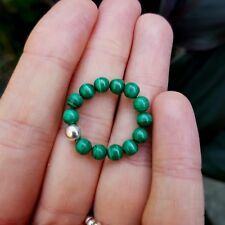 Green Jade balances and harmonizes the Heart Chakra. The Heart Chakra is located near the center of the breastbone. When the heart chakra is out of balance. Sterling Silver Aqua Green faceted Chalcedony stretch ring. Faceted Chalcedony gemstone size: 4mm. It is used in crystal work for many things. It is used to lessen hostility and bring emotional stability. Lapis Lazuli is the birthstone for September. Gorgeous BLUE LAPIS LAZULI Sterling Silver stretch bead ring. Lapis Lazuli is related to both the throat and brow chakras, often bringing a strong synergy to their individual energy patterns. Chakras - Sacral Chakra, Solar Plexus Chakra, Crown Chakra. Citrine is the birthstone for November. Citrine energises every level of life. It cleanses the chakras and opens the intuition. Citrine attracts wealth, prosperity and success. I have this ring available in all 12 Birthstones, all 7 Chakra stones about 36 gemstones to choose from in total matching necklaces. Turquoise is the birthstone for December. Blue Turquoise Sterling Silvergemstone stretch bead ring. Pretty Lapis Lazuli Sterling Silver stretch bead ring. Lapis Lazuli is traditionally a stone of royalty. Truly royal! Lapis Lazuli is the birthstone for September. Lapis Lazuli is related to both the throat and brow chakras, often bringing a strong synergy to their individual energy patterns. Onyx is associated primarily with the root chakra. It assists with challenges in life, especially those caused by a drain of energy. It prevents the draining away of personal energy and can be used for protection from such. Green Onyx is related to the Heart Chakra. This stone creates a bridge between the upper three chakras and lower three chakras. Green Onyx Sterling Silver stretch ring. The Green Onyx is the symbol of restfulness and purity. Gorgeous GREEN African Turquoise Sterling Silver stretch ring. Healing properties of Turquoise. If given a turquoise by a loving friend, that stone would protect the wearer from negative energy and bring good fortune. With a minimal and elegant design, your ring will go perfectly with every outfit! You can also stack it with your other fav rings! Crackle beads are beautiful & vibrant, adding life jewellery. Purchasing even a small piece of jewellery will make a huge difference and will help save these elephants before its too late. January Birthstone Jewellery : Garnet or Rose Quartz. The Garnet is associated with the thyroid and spleen. Information that is beneficial and helpful will usually be released for the searcher. Gorgeous red Garnet Sterling Silver stretch bead gemstone ring. Chakras - Throat Chakra, Third Eye Chakra, Crown Chakra. These rings are perfect for stacking up, with my other stretch bead rings. Labradorite, also known as Spectrolite, is a Feldspar mineral. Sterling Silver LABRADORITE gemstone bead STRETCH ring. The Garnet is associated with the thyroid and spleen. Information that is beneficial and helpful will usually be released for the searcher. Gorgeous red Garnet Sterling Silver stretch bead gemstone ring. It was such an amazing experience! I got to care for many of the elephants 🐘. A few were over 90 years old! With a minimal and elegant design, your ring will go perfectly with every outfit! You can also stack it with your other fav rings! With a minimal and elegant design, your ring will go perfectly with every outfit! You can also stack it with your other fav rings! Purchasing even a small piece of jewellery will make a huge difference and will help save these elephants before its too late. Gold Filled Black Spinel Stacking Ring Q Handmade U.K. These lovely delicate boho style rings are ideal for stacking or layering with other rings. Thin 14K gold filled stacking rings 1mm. Size Q Hand wrapped tiny black spinel gemstone beads using 14K gold filled wire. If you like this ring but need a different size please contact me to see what sizes I have in stock. Thank you. Gorgeous WHITE HOWLITE Sterling Silver stretch bead stacking ring. Howlite will calm and soothe the emotions, slow the overactive mind and help to achieve a deep and restful sleep. Howlite can help to access/retrieve wisdom during the dream state and bring it back into consciousness upon waking.